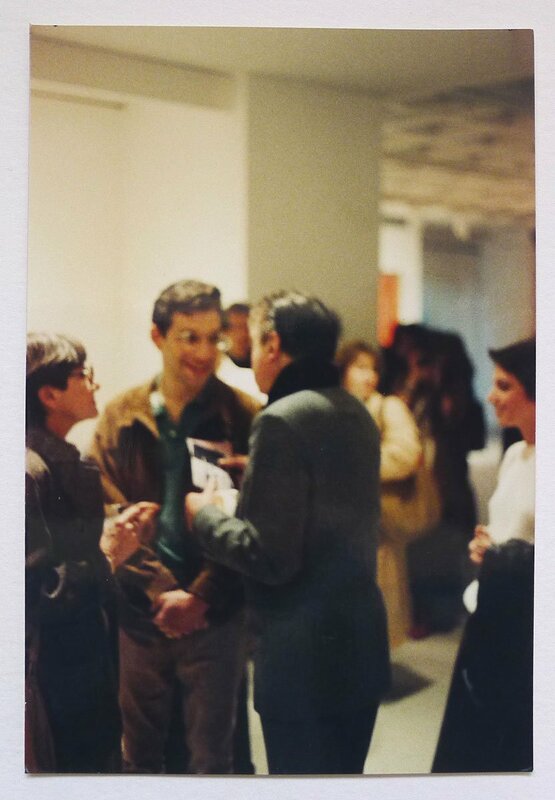 Francis BaconThree colour photographs of Francis Bacon at a gallery private view party circa 1980. 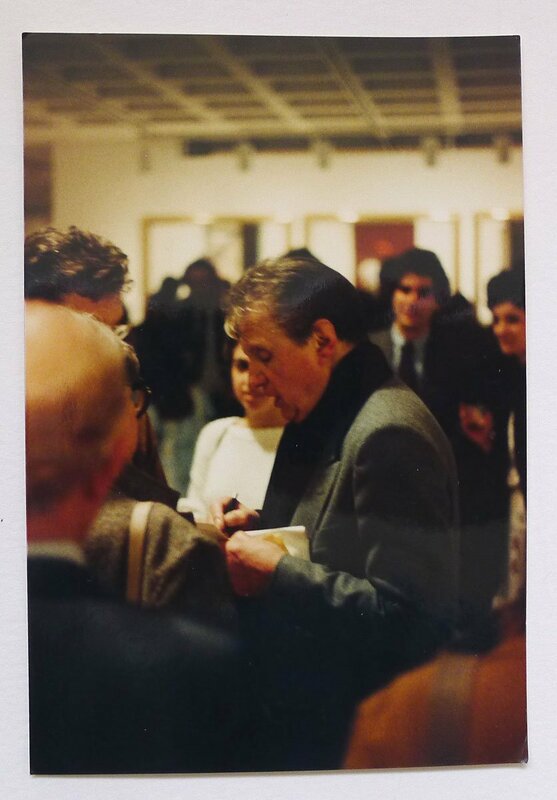 Home / Shop / Books / Three colour photographs of Francis Bacon at a gallery private view party circa 1980. 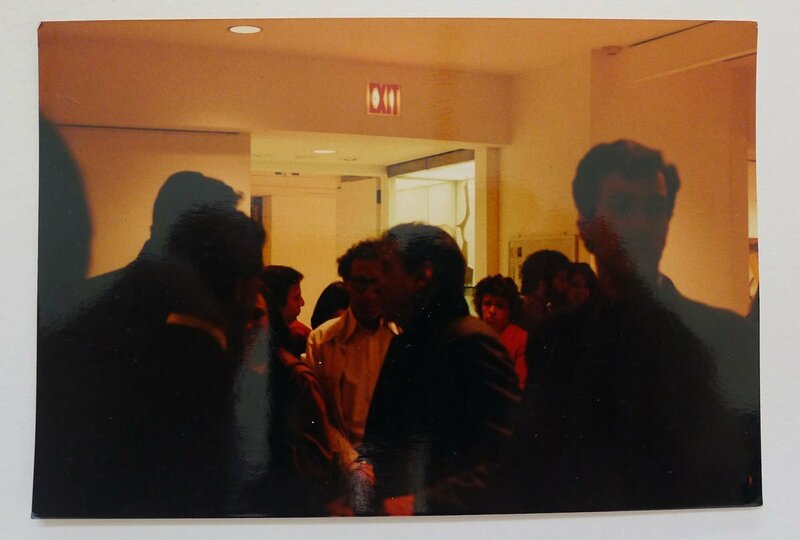 Three colour photographs of Francis Bacon at a gallery private view party circa 1980. 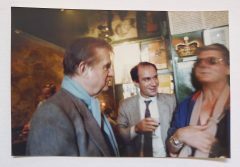 Three colour photographs of Francis Bacon at a gallery private view party circa 1980. 100x148mm. From the collection of John Edwards. John Edwards was Bacon’s companion from the mid-1970s. From the East End of London, Edwards met Bacon in the Colony Club in 1974 through his older brother David Edwards, who was a friend of Muriel Belcher. Edwards and Bacon became very close friends from then onwards. John Edwards was Bacon’s sole heir and in 1998 he donated the entire contents of the Reece Mews Studio to the Hugh Lane Gallery, Dublin. 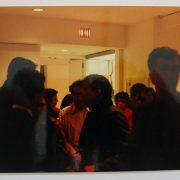 He is the subject of some of Bacon’s most significant portraits such as Portrait of John Edwards,1988. Whatever John Edwards’s other human qualities—and many will testify to his engaging warmth and directness—it is as the subject of many of Bacon’s important paintings and for his proud commitment and deep sense of responsibility towards Bacon’s artistic legacy that he will be remembered beyond his immediate circle of friends. He was born in Hackney, East London, on 10 September 1949, the third of the six children of John and Beatrice Edwards. John Edwards Senior was a dock-worker, but had been both a champion boxer and a World War II hero who rescued two crewmates from the sea after their ship, HMS Bedouin, had been sunk by enemy bombs; a year before his death in 1997 he was awarded the Maltese Cross. Though fond of his children, he could be a strict disciplinarian, against which the sensitive John, and to a lesser extent his three brothers, Leonard, David and Michael and his sisters Pat and Coleen, were inclined to rebel. Severely dyslexic and consequently poorly educated, John Edwards Junior could scarcely read or write, but managed to overcome this by dint of his engaging personality. The story of Edwards’s first meeting with Bacon is now well known. As habitués of the Colony Room in Soho both men were friendly with the club’s owner, Muriel Belcher, and the barman Ian Board. At that time, Edwards was managing three of his brothers’ pubs; he had been alerted by Belcher to the fact that Bacon and his friends were planning to visit one of the pubs, the Swan in Straford East, and acting on her advice ordered several crates of champagne. The party, however, had failed to arrive, and when Edwards saw Bacon in the Colony Room he confronted him about the inconvenience he had caused—champagne not being a popular drink with his regulars—in the strongest possible language. Bacon, by now accustomed to universal deference, was duly intrigued by a figure who was neither remotely awed by him nor wanted anything from him. Together they travelled widely, on holidays and to attend the burgeoning international exhibitions of Bacon’s paintings. They frequented restaurants, gambling casinos and drinking clubs together, and Edwards was sometimes required to extricate Bacon from situations in which his sharp tongue threatened to provoke trouble; occasionally Edwards had to resort to violence himself in order to defend the irascible and possibly drunken painter, but most often he intervened when he saw someone was taking advantage of Bacon’s habitual generosity. More significantly, Edwards was the subject of more than twenty of Bacon’s paintings, including major late works such as Three Studies for a Portrait of John Edwards, 1984 and Portrait of John Edwards, 1988. But in accordance with what was, latterly, invariably Bacon’s practice, these were painted exclusively from photographs and from memory, never from life. Edwards, who began to study photography seriously, took photographs on Bacon’s behalf, many of which he used in his paintings; Bacon, who thought very highly of these, would often refer to Edwards as ‘my photographer.’ He also helped Bacon to shred abandoned canvases with a Stanley knife, though he was only invited into the studio area on the rare occasions when things were going well; Edwards commented that ‘painting was always a drama for Francis,’ adding perceptively that ‘he always seemed to be fighting with the canvas.’ In 1984 Edwards took a flat in Stanhope Gardens, only a short walk from Reece Mews, where on most mornings he would join Bacon for breakfast. Three years later he bought a farmhouse in Suffolk, and the furnishing and redecoration of the house, as well as the landscaping and planting of the garden, was one of Edwards’ most cherished projects. Bacon left his ‘true friend’ the whole of his estate, including his Reece Mews studio in South Kensington. Edwards was devastated by Bacon’s death and left London, spending a year in Florida following which he moved to Thailand in 1993. He became deeply devoted to Thailand, and to his home near Pattaya; he also took a keen interest in local affairs and founded and part-funded a dogs’ home there to care for the huge number of stray animals he had encountered since his first visit. 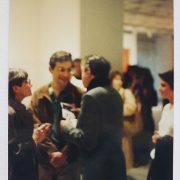 In 1997, concerned at the way in which Marlborough Gallery administered the accounting of his inheritance, Edwards approached his friend, the artist Brian Clarke, for help. Clarke helped him to contact an appropriate legal representative and took up the complex and protracted legal battle that ensued. Sadly, Edwards, who was then fifty-two, but looked considerably younger, contracted cancer in 2002. He had carried out his responsibilities to Bacon’s artistic legacy with exemplary diligence. The first stage of his strategy for the Bacon legacy was the donation of the Reece Mews studio together with the whole of its contents to the Hugh Lane Municipal Gallery of Modern Art, Dublin. In recognition of this generous gift, he was awarded the Lord Mayor’s Medal by the city of Dublin. The meticulously reconstructed studio was opened in 2001 as the visible centrepiece of an important endowment in Bacon’s native city; the myriad objects gathered from the studio have now been catalogued to form an archive that is an internationally important resource for Bacon studies. While his health inexorably declined, Edwards could at least gain satisfaction from having laid the ground for the establishment of a private philanthropic trust, intended to promote the serious study of Bacon’s work. 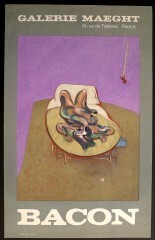 Even from his hospital bed he followed avidly the work of the Estate in continuing to promote the work of Francis Bacon, eagerly anticipating news of the latest exhibitions or catalogues to include his friend’s paintings. 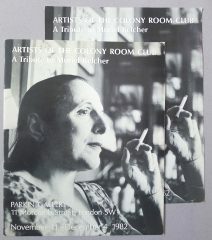 Artists of the Colony Room Club. A Tribute to Muriel Belcher. Parkin Gallery, London November 11-December 4, 1982. Helen Lessore ‘A Note on the Development of Francis Bacon’s Painting’. 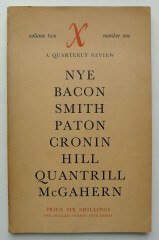 As published in X A Quarterly Review, Vol.2, No.1, March 1961. Three Portraits of Francis Bacon. Later copies. Framed. Colour photograph of Francis Bacon, Ian Board and another in the Colony Room. circa 1980. 148x102mm. Portrait of Francis Bacon at top of stairs. 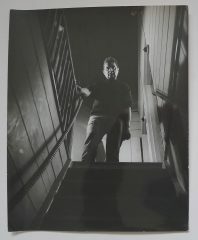 Original gelatin print by Jorge Lewinski. 1970. Studio stamp of the photographer, 197x245mm.